Charles McAuley was born in the Glens of Antrim, 1910. He was renowned for his landscape and figurative work. He briefly attended Belfast Art College and Glasgow College of Art, but was essentially a self-taught artist. James H. Craig encouraged the young McAuley after judging an art competition at a Feis in the Glens of Antrim during his formative years. McAuley better than any other artist, managed to capture the light in the Glens. His first one-man exhibition was at the Master's Hand Gallery, Ballymena. McAuley was an extremely philosophical man who chose to conduct a private pastoral existence instead of chasing recognition. Only those within his close circle of lifelong friends and loved ones witnessed the many facets and depths to his character. 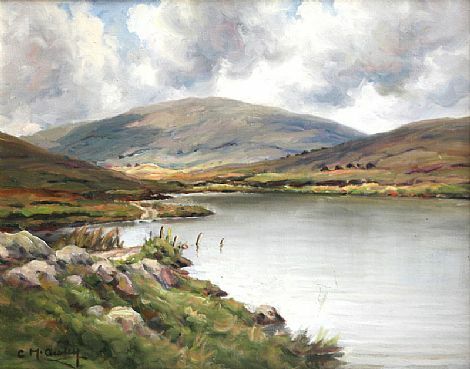 His works can be found in many private collections and in the Ulster Museum. In an interview for a BBC programme in the 1980's he commented that he could have forged a much greater career had he moved elsewhere, but he knew it would not have made him any happier than he was living and sketching in the Glens. It is easy to trace McAuley’s creative development. Earlier canvases have slightly askew perspective and proportion; the oil colours are more untapped. Later canvasses display the significant tonal richness and movement that became McAuley’s trademark. The opulence of oil tones dispersed with the easy and loose stroke of the brush are instantly recognisable. Neither restricted nor fussy, McAuley painted with passion and vigour, creating a mass of affected colour that stirred leaves, refracted light and channelled warm autumn breezes downwards through glens. Famed for landscapes, he also excelled at portraits. More elusive, these paintings are now within various private collections, and are usually of close family members or commissioned subjects. McAuley portrayed intense and vivid portraits, much more evocative than some of the familiar anonymous crooked figures working or lazing within scenic panoramas. Unable to afford luxurious materials in his early career, he painted on card, board and even tea chests during the war. 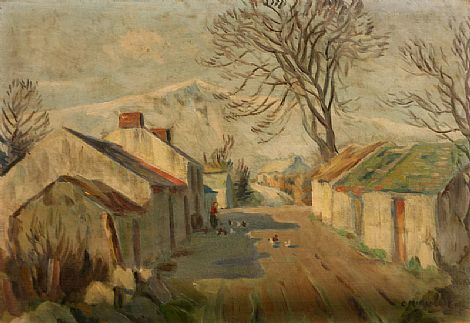 In his early married life, people remember the young artist working in his studio by the village road, often talking to him through the open window. They also remember his lyrical singing, whilst he painted the day away. One of these regular observers was the poet John Hewitt who became a great friend. They were later to collaborate on the publication The Day of the Corncrake. Painting became an obsession and need. And although he was affiliated with collectives such as the Royal Ulster Academy, McAuley sought his own path and determinedly focused on his work, a brave decision for a man with a young family. He was not a business-like artist. Anyone admiring a painting often left with it under their arm as a gift. The BBC declared him ‘one of Ireland’s greatest colourists, but most significantly, a true and modest gentleman’.